Welcome to the Shawangunks! As part of the Appalachians, the Shawangunks — or 'Gunks,' as locals often refer to them — are actually the start of a long, sharp ridgeline running, in one form or another, all the way from New York to Alabama. The ridgeline's northern end is right here in Ulster County, rising from sea level near Kingston and the Hudson River, to reach 2,289 feet at High Point. The ridge's trademark rock, a Silurian quartzite, tops the ridgeline and forms many of its well known landmarks. Locally, this rock is known as Shawangunk conglomerate and is among the hardest rocks in the entire Appalachian chain. Variants of this rock show up all along this slender ridgeline, holding up other landmarks including Delaware Water Gap (NJ-PA), Massanutten Mountain (VA), and Seneca Rocks (WV). For all of its length, the ridgeline separates the Appalachian Mountains from Allegheny and Cumberland Plateaus. Locally, the Shawangunk Mountains extend to the New Jersey border. But the area of most interest to outdoor enthusiasts is where the range widens, extending from a sharp linear ridge to more of a rounded shape, all of which is in Ulster County. This wider area also marks the ridge's highest elevations, twin points of 2,289 feet, in the Lake Marantaza area. Although the Gunks are best known for their rock climbing, it also boasts an incredible number of hikes, including some fantastic viewpoints and spectacular waterfalls. The ridgeline's quartzite, locally known as Shawangunk Conglomerate, is a white rock that forms towering cliffs and rocky landscapes. Not much of this hard rock remains in most areas. As a result, jagged formations of hard cliffs and weaker shale characterize the northern part of the ridge. To the south, a thicker layer of the conglomerate forms a series of folded ridges culminating in the highlands of Minnewaska State Park Preserve and the Lake Marantanza area. Beneath this hard cap-rock is the much softer Marcellus shale, well-known for its deposits of natural gas that can be found in areas to the west, where it is buried beneath thousands of feet of Catskill and Pocono sediments. In places, the hard conglomerate layers are undermined by the faster eroding shale beneath them. On top of the Shawangunks, the conglomerate, which erodes slowly and is composed of little more than silica, provides little raw material for soil. As a result the Gunks' higher elevations are stark places — only the most hearty plants and trees grow well. Among these are pitch pine, sweet fern and blueberry. Fire is an important part of this ecosystem. Most of the Gunks ridgeline is preserved by a group of public and private organizations including the Mohonk Preserve, The Nature Conservancy, the Mohonk Mountain House and the State of New York. In the past, most of the ridge was owned by the resort hotels that once reigned supreme along the ridgeline. Today, only the Mountain House remains. These hotels built the hundreds of miles of carriageways that form the basis for most of the area's hiking trails. The Gunks can be approached from east and southeast from the Hudson Valley or the west from the Rondout Valley. The long ridge and its white cliffs are obvious from either side, with the cliffs most apparent from the east. The long cliff at Millbrook Mountain and Skytop tower above the Mohonk Mountain House are two major landmarks. Once coming to the Gunks, the question becomes where to go. What are the range's highlights and must sees? Bonticou Crag is the northernmost outpost of the Gunks and its signature conglomerate. Accessed from the Mohonk Preserve's Spring Farm parking area, this short hike includes a challenging rock scramble to a terrific viewpoint. Jagged boulders lay like discarded toys along the west face of the crag. Just south of the viewpoint is Guyot Hill, the Gunks' highest summit, which is topped by Marcellus Shale. This view also allows one to look along the Gunks' spine and over to the west and into the Catskill Mountains. Millbrook Mountain is about a six mile round-trip hike, which begins just west of the parking area along Route 44/55 at the eastern edge of the Gunks. This hike skirts the eastern ridgline, slowly climbing to Millbrook Mountain and topping the huge, sheer cliffs that rise along the mountain's eastern flank. The trail also offers a number of pleasant views to east, over the Hudson Valley and to the Taconic Mountains, whose geologic ancestors provided the parent material for the Shawangunk Mountains. Additional good views to the west open from the rocks at the beginning of the trail, an area known as The Trapps. 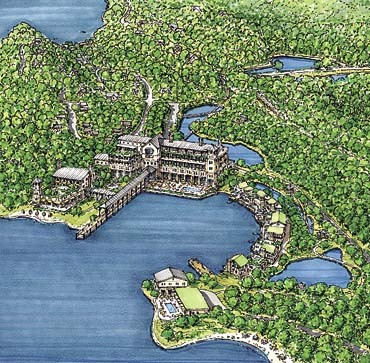 Hamilton and Castle Points are part of an 8.5 mile loop that begins at the parking area adjoining Lake Minnewaska. These trails follow carriageways to the south that are pleasantly warm in spring and fall, but often gruelingly hot in summer. Both points are wide, flat rock ledges with great views to the south and east. Castle Point, located at the top of the ridge, also provides a glimpse into the Catskills to the west. The Gunks also have their share of waterfalls. 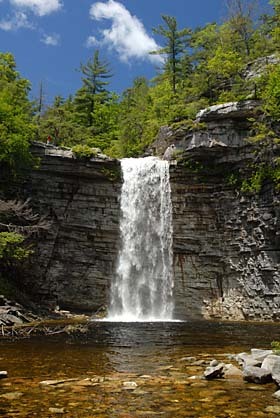 Awosting Falls, located near the entrance to Minnewaska State Park Preserve, is a cool and impressive retreat. Rainbow Falls, tucked away in a deep ravine in the park is a high, thin fall. Verkeerdeer Falls, along the eastern edge of the mountains is a long hike through pitch pine and chestnut oak forests. The Gunks provide many hiking opportunities. Viewpoints, waterfalls, and other mountain highlights offer many days of great hikes for people of all abilities. In addition, the mountains have a character that is unique among the Appalachians and offers many places for observing wildlife, especially raptors during the spring and fall migration, making the Gunks an ideal place to visit any time of the year. Pre-registration is required for all programs as space is limited. For outings, please wear appropriate clothing and footwear and bring snacks and water. A parent or guardian over the age of 18 years must accompany children wishing to participate in any programs. All programs meet at the Nature Center, unless otherwise noted. This series of outings will be offered every Tuesday at 8:00 a.m. Designed for birding enthusiasts, or those just looking to learn the basics, the series will offer various outings led by experienced birding volunteers and park naturalists. Participants will meet at the main entrance and should come prepared with binoculars and a field guide. Outing destinations will be determined the day of the program. This series of outings will be offered every second and fourth Tuesday of the month at 10:00 a.m. Designed for people who are home during the week, such as retirees, stay-at-home Moms and Dads or people with weekdays off from work, the series will offer modest outings led by a park naturalist. Join park environmental educator Renee Jones for an interpretive nine-mile round-trip hike to one of Minnewaska's favorite waterfalls. Renee will lead you along Castle Point carriageway to Blueberry Run footpath, returning along Upper Awosting carriageway. Bring plenty of water and snacks or lunch. Join naturalist Eric Van Deusen on a guided walk to learn about the many species of lichens found on the rocks all over Minnewaska. It's easy to take these amazing organisms for granted, but Eric will teach you just how interesting and how prevalent they really are! Meet at the Peter's Kill parking area. You and your children can join environmental educator Laura Conner and Gardiner children's librarian Nicole Lane for a lesson in book making. After completing their own nature journal, children will explore the bike path behind the library to learn about nature and put their own creative responses to the experience in their nature journal. Jillian Koehnken, park environmental educator, will lead this adventurous eight mile long hike to Gertrude's Nose. On a clear day, the views from this prominent cliff are truly breathtaking, making this challenging hike particularly rewarding. Join environmental educator Laura Conner for a leisurely walk to look for spring wildflowers. These short-lived beauties of the forest floor are exciting to find and fun to learn about. If you have a wildflower field guide, please bring it with you. Location to be determined. Monday, May 25, 10:00 a.m. – 12:00 p.m.: Ponds, Creatures, Fun! Come explore the ponds and lake edges of Minnewaska as they come alive in spring. Kids will learn about invertebrates, salamanders, and get hands-on opportunities to discover the secret world of pond life. This program is recommended for children aged eight to twelve and their parents. Remember to bring waterproof boots! Start your holiday with a moderate hike along the Lake Minnewaska and Millbrook Carriageways. We'll also explore the beginning of the Gertrude's Nose Footpath, which follows along the scenic edge of the cliff overlooking the Palmaghatt Ravine. The total distance walked will be 3.5 miles. On this four mile long hike, a park environmental educator will lead you to a section of forest that burned in the forest fire in April 2008. Along the way, the hike will follow the Mossy Glen footpath to the Blueberry Run footpath, eventually leading to a section of the Long Path, where we will witness charred trees surrounded by an abundance of new growth. Meet at the Awosting parking area. The fee for parking at Minnewaska is $6 per car. There are no additional fees for public programs, unless noted otherwise. For the month of May, the Park will be open from 9:00 a.m. until 8:00 p.m. Minnewaska State Park Preserve consists of approximately 20,000 acres of wild and scenic land located on Route 44/55, five miles west of the intersection with Route 299 in Gardiner, New York. Minnewaska State Park Preserve is part of the Palisades Interstate Park Commission, which administers 29 parks, parkways, and historic sites for the Office of Parks, Recreation and Historic Preservation in New York as well as the Palisades Interstate Park and parkway in New Jersey. For more information about New York State parks and historic sites, please visit www.nysparks.com and for more information about the Palisades Parks Conservancy and the Palisades Interstate Park parks and historic sites, please visit www.palisadesparksconservancy.org. The Palisades Parks Conservancy, Inc., (dba Friends of the Palisades, Inc.), the charitable partner of the Palisades Interstate Park Commission is a free-standing federally registered non-profit corporation exempt under section 501(c)(3) of the Internal Revenue Code. Donations may be made over our secure Web site at palisades.exhibit-e.com/donate/ or by mailing to Palisades Parks Conservancy, Bear Mountain State Park, Administration Building, Bear Mountain, NY 10911. For more information, please call us at 845-786-2701 or send an email toadmin@palisadesparksconservancy.org. The D&H Canal Heritage Corridor is a developing 35-mile trail from Kingston to the Basha Kill Lake area just south of Wurtsboro. It is comprised of the Delaware & Hudson Canal towpaths and the Ontario & Western Railway. They offer guided walks, biking, equestrian, cross-country skiing, and events throughout the year. Call 1-800-342-5826 for more information. D&H Canal Heritage Corridor North, in the Town of Marbletown, runs from Stone Ridge through Hurley to just south of Kingston near St. Remy. D&H Canal Heritage Corridor South is in the Town of Wawarsing and runs from Summitville through Wurtsboro to south of Basha Kill Lake. Many rail trails have been named in honor of prominent people who lived in the area and contributed to the community's success. Our portion of the rail trail is no different and is referred to as "The Jesse McHugh Trail." And for those of you who don't know who Jesse was — he was the Shawangunk Town Supervisor from 1949-1963 and with his wife ran a local funeral home. A dedication and grand opening ceremony for the 'Wallkill to Walden Rail Trail' is planned for Saturday, May 2. There will be kiosks located at each end of the trail where maps and information about the local area will be available. In advance of the actual ceremony will be the promotion of a rail trail map sponsored by the Walden Business Association in conjunction with the Town of Shawangunk as well as many other local organizations. Full details of the day's events will be published at a later date, so stay tuned. Any local businesses that would like to be part of the map, which will be a 17 by 22-inch full color map with pictures and information, can purchase an ad. The choices available will be an 8.5 by 3.5-inch full color ad with indicator numbers for $400 or a 3.5 by 2-inch full color ad with indicator numbers on the map for $100. 25,000 of them will be available for distribution. For more information contact Ciardullo Printing at mdprint@frontiernet.net or call Mike Ciardullo at 778-5812.